December 9, 2016 ~ Lorra B. Times are tough for the average American looking for a job but when you figure in a disability that requires a service dog be present at all times that task seems an impossibility. For Air Force veteran, Clay Luthy, a job became a reality when a Lowes store in Abilene, Texas hired him and his 10-year-old service dog. According to The Huffington Post, Clay, 35, had endured several knee surgeries that kept him from reenlisting in the Air Force. Because he needs his service dog, Charlotte, with him in case of falls, it was a struggle to find work. Though Luthy’s line of work after the military had mainly been handy-man gigs. His wife, however, suggested he apply at the store in which he spent so much time, Lowes. 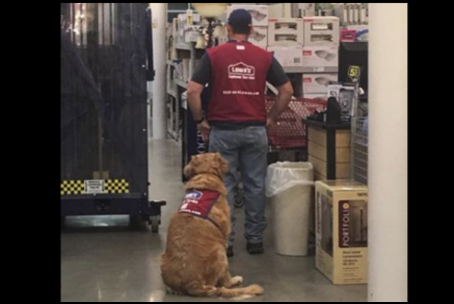 Lowes has always allowed well-behaved non-service dogs in their stores but what most people may not know is they also have an undisclosed number of service dogs working at various locations. Over the last two months of employment with Lowes, the duo has been a huge hit as they both perform their jobs in matching vests. Judy Decher Rose, a Lowes customer, went to Facebook with her excitement over the unusual hiring. Well, Rose’s Facebook post went viral in no time being shared almost 200 thousand times thus far. Praise for Lowes continue to pour in as the likes and shares to the Facebook post go ever higher. A spokesman for Lowes reaction to the whole media frenzy is nothing short of modest as he stated that hiring the two was “simply a matter of accommodating a qualified employee,” according to The Washington Post. Not only has Charlotte, the retriever, won the hearts of customers but so has Lowes and their willingness to work with the brave heroes that serve our country proudly and selflessly. This entry was posted in Military, News, Politics and tagged Air Force, conservative blognetwork, Disabled Vet and service dog, Loews. Bookmark the permalink. This is one of the coolest things I’ve read in a while. Thanks!! How blessed to be around them!!! They are better than most of us humans! LOL! yes, they are…although they are not suppose too, they willingly give love and show affection when they are told not too, lol. Hope your trip is going well, Lorra. See..I KNEW there was a reason I shopped at Lowe’s! Neat story. Sometimes it seems businesses can honor disabled vets better than the VA which is unfortunate. Good for Lowes……..and great article my friend. Hope you are well. Theanks for the RB!! 🙂 Have a great day!! Respect for the employer (and above all the dog). Time Is Like a River – And It Has Flowed Beyond Our Reach… IS IT TOO LATE FOR AMERICA? Sparky on Merry Christmas Everyone!!!! Zip-a-Dee on Merry Christmas Everyone!!!! Steve Dennis on Merry Christmas Everyone!!! !